The modern Islamic Republic of Iran occupies only a part of what were Iranian lands in antiquity. At various times, parts of all the modern nations in the map below were considered to be "Iran". The plateau: the land to the east of the Zagros mountains is a plateau well above sea-level. The lowlands: to the west of the Zagros mountains are fertile lowlands (Iraq in the Persian language, once better known by its Greek name Mesopotamia -"the land in the middle of the rivers"). These lowlands - no longer part of modern Iran - became the most important part of the territory of ancient Iran. The deserts: the central area of Iran is largely one of the hottest deserts on earth. The mountains: the plateau is enclosed by high mountain ranges to the north, west and east. The rivers: In the lowlands the mighty Euphrates and Tigris; elsewhere there are none of importance - except the Oxus, in the far northeast, which, for much of its history, marked the boundary of Iranian territory. The seas: the Caspian to the north; to the south the Persian Gulf and the Indian Ocean. But the Iranians were never seafarers. 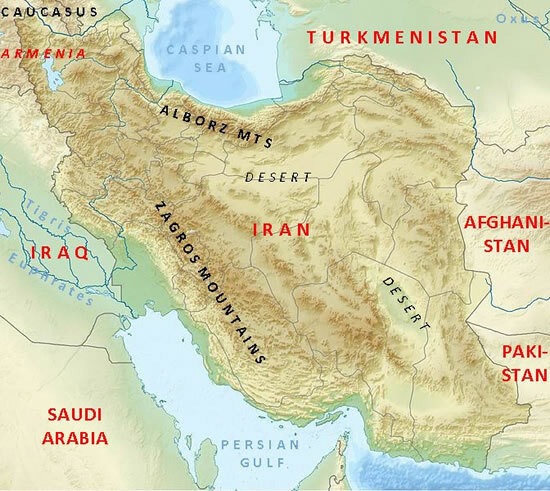 The ancient land of the Iranians was not confined by the modern frontier as shown on the map. Iranians lived in Bactria (Afghanistan), Chorasmia (Turkmenistan), Sogdia (parts of Uzbekistan and Tajikistan) and Babylonia (Iraq) - and frequently claimed territory further afield. Eventually, the Iranians evolved a distinction between Iranshahr - the true heartland of the Iranians (Iran, and parts of Afghanistan, Turkmenistan and Iraq) and An-Iran (non-Iran: territories that they might rule but were not inhabited by Iranians - Turkey, Syria, Egypt). An interesting case was Armenia (not the modern state, but then meaning the territory south of the Caucasus between the Caspian and Black Seas - incessantly fought over in ancient times). Iran regarded it as part of Eranshahr - though many Armenians didn't. On the map, Iran looks secure inside its barriers of mountain ranges and sea: in reality, though, it has been continuously vulnerable to attack and invasion - from Turkmenistan, over the Caucasus, through Afghanistan and from the west. But, despite invasions, the Iranians of the plateau have throughout the centuries, managed not only to keep their own culture, but to convert the newcomers to it - whether Greek, Arab, Turk or even Mongol. If Persians are Iranians, are Iranians Persians? The vast plains of Central Asia, stretching from the Urals to China were the earlier home of many of the peoples of today's Europe and Asia ("the Eurasian land mass"). These peoples, nomads constantly moving to find pasture for their animals, have migrated west (towards Europe), south (towards the Iranian plateau and India) and east (towards China) in search of fresh grazing. The Iranians were one such people of the Central Asian plains - horse-riding cattle herders, with a language and customs (including the basic beliefs and traditions that came to be recognised as "Zoroastrian") distinguishing them from other groups. From well before 1000 BC, some of them started moving south on to the Iranian plateau. One Iranian group was the Medes, who settled to the southwest of the Caspian, another was the Persians, who came to occupy an area to the south-east of the Zagros mountains. They met older-established cultures, including the Assyrians, Babylonians, Urartu (Armenia) and the Elamites. Pressure to move on came not just from the need for new pasture (perhaps triggered by climate change). Behind the Iranian tribes were other groups of tribes who would in due course follow their path out of Central Asia: including Huns, Turks and Mongols. All these peoples later left their mark on Iran. By the beginning of the 6th century BC, in a small corner in the south-west of the plateau, an Iranian people had quietly established themselves. They called themselves, and their land, Parsa. Though they are better known by the names the Greeks used: Persis (hence the Romans' - and our - "Persia") and Persai (Persians). They had even taken over some territory, Anshan, from the once mighty Elamites. But they were not yet strong enough to prevent themselves being taken over by their more powerful northern neighbours, the Medes. Today it's called Fars. In the west the country was known as Persia from the time of the ancient Greeks, until the monarch Reza Shah in 1935 decided he wanted it be called Iran, which it's been known as ever since. But Iran is the name the people themselves have always used. For a fuller discussion see Wikipedia entry here. Persian/Persia will be used specifically for the people who settled in Fars, their territory and the empire they built under the Achaemenid kings. But bear in mind, it was the name used by its enemies, the Greeks. Iranians will be used for the peoples who inhabited the plateau and the lands bordering it, who thought of themselves as belonging to Eranshahr, but not necessarily as Persians (Parthians, Bactrians and many others that we'll come across). 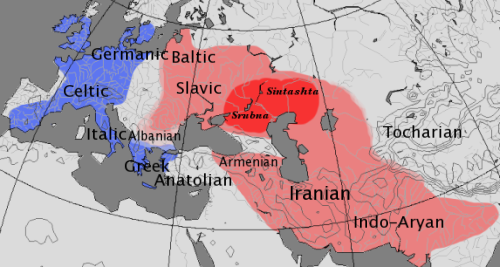 The Indo-European language family around 500 BC. There are two groups indicated by the colours. Click on map for more. Mesopotamia means "the land between the rivers" - the river Euphrates and the river Tigris [see map]. It's now Iraq - site of some of the world's most ancient cities and centres of civilisation. From the time of the conquest of Babylon , then its major city, by Cyrus in 539 BC, it became the most important part of the Persian territory. Another ancient name for it was Iraq, a Persian word that means "lowlands". The Parthians, Sassanians, Abbasids and Seljuqs all had their capitals in this area between the rivers. Several countries have more than one name. For example is the United Kingdom the same as Great Britain? What the Greeks (Hellenes) call Hellas, we, perpetuating a Roman mistake, call "Greece". We annoy people in the Netherlands by calling their country "Holland". India, like Persia, has a name given to it by the Greeks - what's its real name? The word 'Iran' (ariya) was an ancient name for the country, as found in the Bisitun inscription of Darius the Great. From it derives "Aryan" (the name used by Darius for the Old Persian language) with its many unwelcome 20th century connotations. Evidence from DNA analysis shows that the population has changed remarkably little since ancient times. 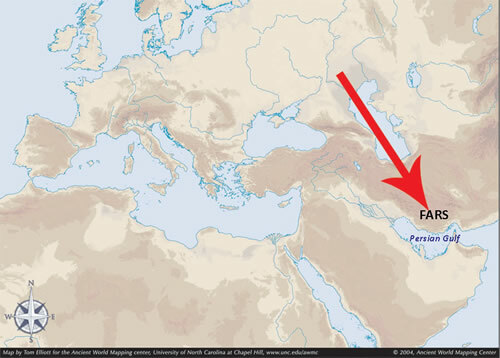 Many Iranians living in Fars today are direct descendants of the ancient Persians. The words are more commonly spelled Eranshahr and An-Eran. The terms became popular in Sasanian times (AD 224 - 651). Migrating at about the same time, and closely related, were the Medes, who settled to the north of the Persians. The Medes and Persians were not the last - there were several later Iranian invasions/migrations into the plateau, among them the Parthians who ruled there for 500 years. In later times, Iranians from Central Asia brought culture and enlightenment to the region, from where it eventually percolated into medieval Europe. An army officer who seized power in Persia in 1921 and made himself "shah". He encouraged the use of the name Iran. It was thought that "Persia" sounded exotic but backward, associated with carpets, cats and oriental luxury. Full story here. Derives from Airya, an adjective meaning "noble, the best" (correlate with Greek aristos: and Airyana, meaning "of the best", which became the name for the people and their land. It often appears as "Ariana", and the people as "Arians" or "Aryans". These terms are little used by western writers, because of their illegitimate use in the 20th century by the Nazis. In modern Persian it should be "Pars" - but under the influence of Arabic (there's no p in Arabic) it's become Fars, and the language Farsi. dokhtar = daughter, baradar = brother, pedar = father, nam = name, dar= door, tarik = dark, tondar = thunder, now= new.